UFC president Dana White and reigning welterweight king Georges St-Pierre (pictured) had a phone conversation on Thursday to clear the air about St-Pierre’s future. On Friday, the two hosted a conference call to share some of what they chatted about with the world. Unfortunately for fight fans, they won’t like what St-Pierre had to say. St-Pierre announced he will relinquish his UFC belt, jewelry he’s donned since April 2008, and leave MMA in his rear-view mirror for the time being. “I’ve been fighting for a long time. I have 22 fights in the UFC, 15 of my fights is for a world title. I’ve been fighting for a long time at a high level. It’s a lot of pressure, a lot of criticism, and I’ve decided I need to take time off,” St-Pierre stated. “I know the UFC is a business, they can’t wait on one little person. They have to keep things rolling, so I have to vacate my title for the respect of the other competitors. White blasted St-Pierre at the post-fight press conference for his announcement, claiming his biggest pay-per-view draw owed it to everyone to grant Hendricks an immediate rematch. However, White softened his stance once GSP arrived at the presser. Today, White backed St-Pierre’s decision to step away. Various reports have surfaced about the personal problems that forced St-Pierre to leave MMA at the peak of his career – ailing father, impregnated a woman who he didn’t want to have a baby with and owing his former manager millions in future earnings after a lost legal battle. All of those rumors have since been shot down by St-Pierre’s camp. 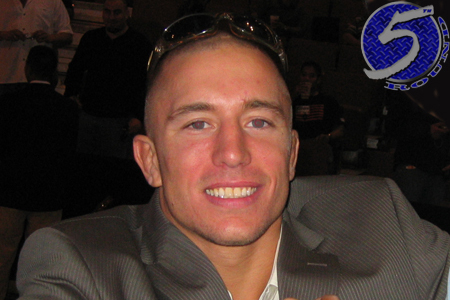 GSP once again refused to disclose his personal issues during Friday’s call. White said Hendricks and Robbie Lawler will battle for the vacant welterweight title at UFC 171. St-Pierre owns a 25-2 professional record. He is the UFC’s most decorated welterweight champion having defended his throne nine consecutive times.